Clayton Off Road Inc. now offers three LJ short arm lift kits. Every kit includes coils front and rear, DOT approved stainless steel brakelines, JKS disconnects, adjustable trackbars, rear trackbar bracket, rear swaybar extensions and coil retainers front and rear. The entry level kit is for the customer who has a lower budget in mind for his LJ build, however still wants a properly setup Jeep. 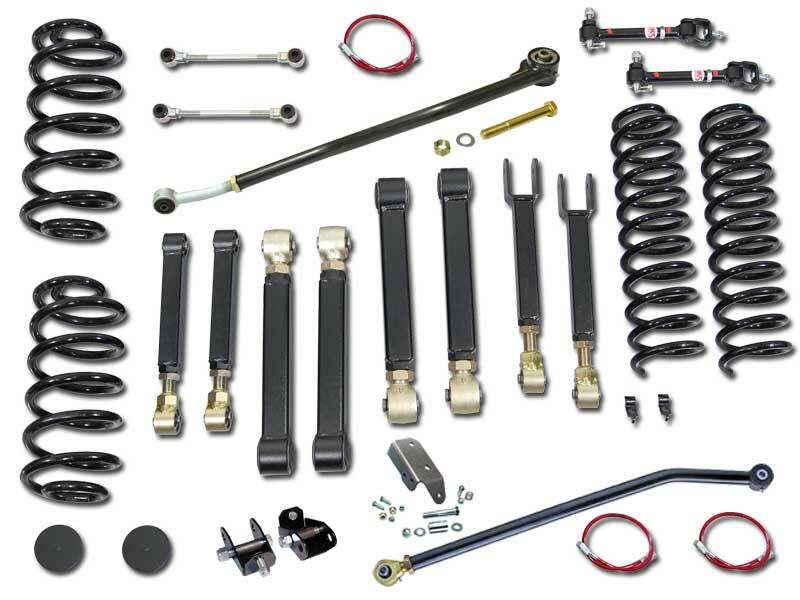 Therefore this kit features adjustable upper control arms which are very important to allow for proper caster angle and pinion angle adjustment. The Premium kit adds heavy duty adjustable lower control arms, for added strength, adjustability, and flex. Kit also comes with bolt on shock extensions to eliminate the need to notch the rear coil buckets. This is a fully bolt on kit. The Ultimate kit uses many of our components from our award winning long arm kits. Therefore this kit does require some minor welding. This kit uses our trackbar and adds our 5/16 laser cut drop trackbar bracket. This allows unrestricted trackbar movement in a double sheer alignment for ultimate strength. The mount also lowers the angle, and therefore we also include a drop pitman arm. Another advantage is our weld on rear shock conversion kit. This gains you clearance, strength and proper alignment for your rear shocks.